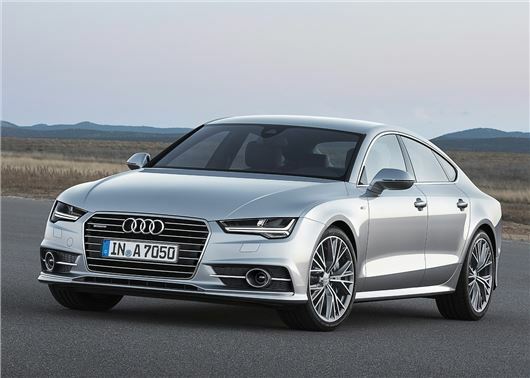 Audi has unveiled the facelifted A7 Sportback and S7 Sportback. Both models get minor styling updates, revised engines and new powertrains. There are no details on pricing yet, but expect to pay £43,000 when the facelifted A7 Sportback goes on sale in the UK in November 2014. Exterior changes to the A7 Sportback and S7 Sportback are limited, with just a new hexagonal grille and restyled bumpers to tell it apart. However, Audi has added LED headlamps as standard and Matrix LED headlights will be available as an option to reduce glare to oncoming vehicles by dimming individual diodes to oncoming traffic. Inside the A7 Sportback is almost identical to the outgoing model, but Audi has added its latest infotainment system, with revised interface and MMI touch, which enables the driver to scroll and zoom in lists and maps via a touchpad. Audi has also introduced new interior materials to the A7 Sportback, with five new colour options, including Valcona leather, Lunar silver and aluminium/Beaufort walnut inlays. However, the overall layout remains unchanged and boot space is the same 535 litres, which increases to 1390 litres with the rear seats down. Under the bonnet buyers can choose from five engines - two petrol and three diesel units – with outputs ranging from 218PS to 333PS. The only new powerplant in the range is the 218PS 3.0 TDI, which returns a claimed 60.1mpg and produces 122g/km of CO2. The V6 diesel is linked to a front-wheel drive layout, with a redeveloped seven-speed automatic ‘box. The 3.0 TDI biturbo tops the diesel range, delivering 320PS with an eight-speed tiptronic transmission. The S7 Sportback gets the familiar 4.0-litre TFSI, which delivers 450PS and uses Audi's cylinder on demand technology to deactivate four-cylinders at cruising speed or low revs. Audi tell us some engine configurations will equipped with new lightweight brake and power steering system, with electromechanical drive for improved fuel economy. However, as with the pricing, this is to be confirmed.